In July 2017, Lisa was enjoying the sun in her friend’s garden. The friend had a zip-wire which the children were playing on and Lisa thought she might have a go. She fell from about 6 foot off the ground and landed badly. Instantly she knew there was a problem but she put on a brave face for her children and friends and got a lift home. An ambulance was called on the journey home and Lisa went to hospital for a CAT scan and MRI. The scans confirmed that she had sustained a burst fracture to her C7 vertebrae when her head hit the ground. Even though the injury didn’t affect Lisa’s spinal cord, the scans showed that it was a near miss. She was able to make a full recovery with a neck brace. Following the accident, Lisa took time to consider the effects of a spinal cord injury both on the person involved and on their loved ones. Whilst searching for what support is available, she stumbled upon Back Up. Luckily for us, Lisa resonated with our cause and she decided that she wanted to fundraise to show her support. Being a runner before her accident, Lisa had previously run a few half marathons. 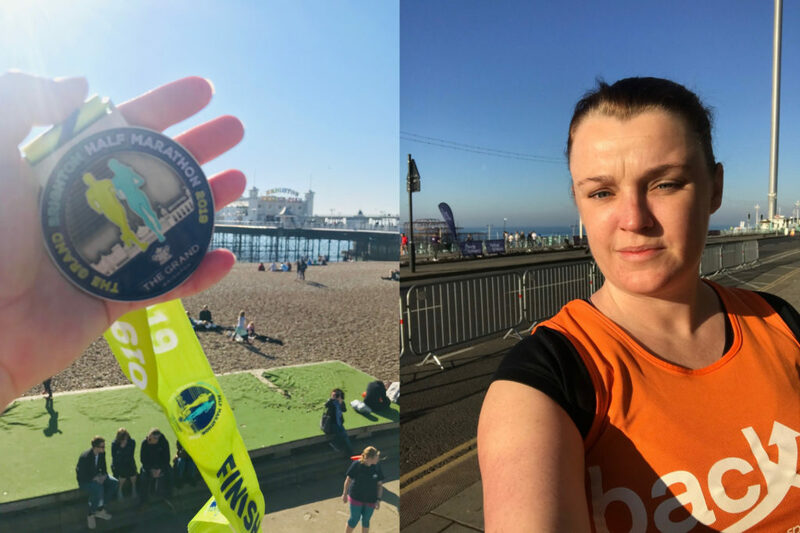 But since her injury, she’d lapsed on her fitness and “turned into a bit of a pudding.” Lisa decided to take on her own personal Everest and run the Brighton half marathon. The race was both a physical and mental challenge. Lisa managed to raise a fantastic £935, crushing her initial target of £500. This could help pay for over 20 people to go on one of our wheelchair skills sessions. Furthermore, on the morning of the race she managed to convince her husband to run the Brighton half next year for Back Up. A promise she intends to hold him to! If you’d like to take on a challenge for Back Up then see our fundraising pages to get some ideas. To discuss taking on a challenge or holding an event to support Back Up, email Reece or call him on 020 8875 1805.